actually sugar is not really the problem it is malnutrtion or unbuffered sugar that is the problem low fat diets and sun avoidance(use of sunscreen is a disaster) for example are reaping havoc with our ability to handle glucose properly. chromium, zinc, iron depletion,, calcium, vita d, a, k, etc are fat soluable need fats to absorb and use them and these nutrtients are vital for proper glucose metabolism. getting fat is a buffer to glucose intolerance caused by dieting efforts and nutrtional deficieny. our ability to store excess fat on limbs, stoamch heart and liver is a adaptation to the inability for the body to handle glucose properly.if people didnt get fat during nutrtional deficney you would see alot more dead people at younger ages then you do. Thanks for the comment. I completely agree that the developed world is over-fed and under-nourished. The fact that certain foods such as fats and carbs have been vilified is also not helping. In the end it is very simple: we all just need a balanced diet with enough of all types of macro and micro nutrients. 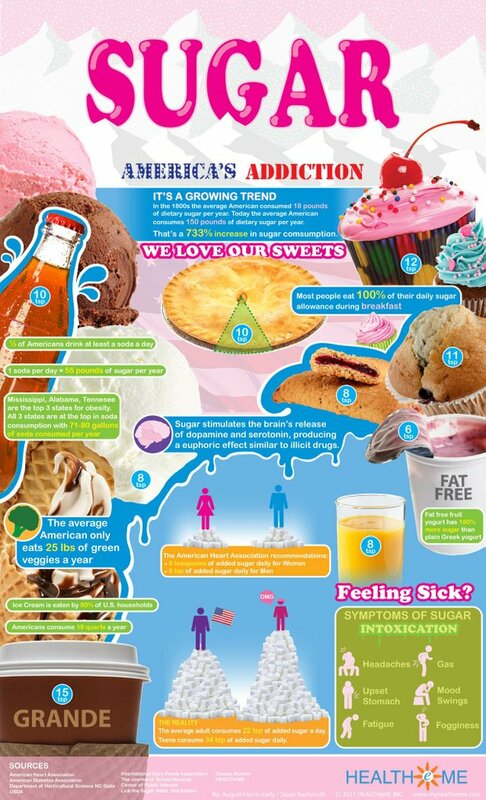 That being said, however, the sugar consumption in America is a little out of control, don’t you think?